The shackle is the ‘U’ shaped bar that locks the padlock in place. The clearances underneath the shackle need to be greater than the thickness of the material you are locking through. The C-Series Line of MUL-T-LOCK Padlocks is designed to offer Patented High Security Key Control and Strong Physical Protection to Padlock Security. 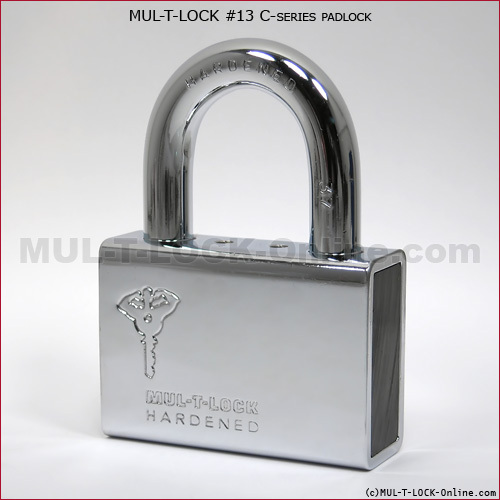 All C-Series Padlocks are made with a hardened steel body shell, and a hardened steel shackle. They are available with or without a Shackle Guard for extra protection, and are also available with a pop open shackle or completely removable shackle. Varying in different shackle diameters and clearances the C-Series Line will accommodate any padlock requirement. High security padlock, for general use with Mul-T-Lock® hasps or shackle protectors. Unlocking with 55˚-65˚ key rotation. Pop open with retaining key (key needed for closing). Variety of shackle clearances. Core: Black Plated Solid Brass. Shackle: Hardened Boron Alloy Steel. Protective shutter to prevent dust contamination. Drainage holes to prevent freezing. Mul-T-Lock® unique high precision 10 telescopic pin tumbler system. Reversible Nickel Silver key with plastic key head and coloured insert for identification. Orders for keys marked “do not duplicate” should only be made upon presentation of a key card. Keyed different, Keyed alike, Master keyed.